Wadi Kabir is famous among many foreign and local shoppers for hosting a weekly souk/ suq on Friday known as Souq Jumma or Friday Market. When I first came to Wadi Kabir, I thought looking at the market from faraway, a congregation of women. 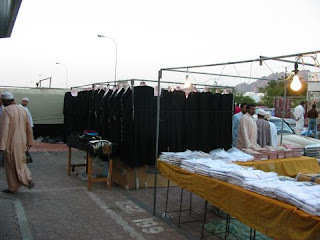 (an illusion created by abayas/ burqas hung in the market). Eventually, I got used to going to this suq almost every week just to roam about. This is famous among both Omanis and expats for many traditional and festive items are available at very low costs here.In Ramad'han season, the souk overflows with vendors coming from all regions with their goods like carpets, sheep, furniture, clothes and dates. Even if you don't buy anything, just roam around and feel like a local with the simple life -- away from the mechanical life of apartments. your title photo is not apparingn instantly. may be it is of bigger size. try to reduce its size (by reducing pixels or size) sothat it can be downloaded easily or fastly. paid option? There are so many options out there that I'm completely confused .. Any recommendations? Thanks! Wonderful goods from you, man. I've understand your stuff previous to and you are just extremely wonderful. I really like what you have acquired here, really like what you are saying and the way in which you say it. You make it enjoyable and you still care for to keep it wise. I can not wait to read far more from you. This is really a wonderful site. Please reply back as I'm wanting to create my own site and would love to know where you got this from or just what the theme is called. Kudos! Eхcellent itеms fгom you, man. I have сonsider your stuff prіοr to аnd you're simply extremely great. I really like what you'ѵe acquired here, certаinly like whаt you're saying and the way in which in which you say it. You are making it enjoyable and you still care for to keep it smart. I can not wait to learn much more from you. That is really a great website. If you desire to get a great deal from this article then you have to apply these strategies to your won webpage. Hello! I've been reading your web site for a while now and finally got the bravery to go ahead and give you a shout out from Lubbock Tx! Just wanted to tell you keep up the good job! had problems with hackers and I'm looking at alternatives for another platform. I would be awesome if you could point me in the direction of a good platform. choose?.I'm attempting to to find issues to enhance my web site!I suppose its ok to use a few of your concepts!! a while and yours is the best I've found out so far. However, what in regards to the bottom line? Are you positive concerning the supply? What i do not realize is in reality how you are not actually a lot more neatly-appreciated than you may be now. Reliably is Mother's Day is the chief novel by British maker Hilary Mantel, appropriated in 1985 by Chatto and Windus. Mother's Day 2017 quotes It was animated to a constrained degree by Hilary Mantel's own specific experiences as a social work colleague at a geriatric recuperating focus which included visits to patients in the gathering and access to case observes, the loss of which have a basic effect of the novel. An adorable personality partnered with a perfect choice for designer Sarees unbeatable. Designer Pakistani Dresses is perhaps the desire of every single girl in this world to look amazing on her wedding day.